The new Pre Box S2 Digital compact preamplifier/DAC with MQA and DSD512 support marks a new era for Pro-Ject's renowned S-series components. And it's Roon-ready, too. For the very first time ever, Pro-Ject is using a dual mono configuration with flagship D/A converters made by ESS Sabre. The cutting-edge ESS9038 dual DAC ensures the highest quality audio performance in a small and affordable package. 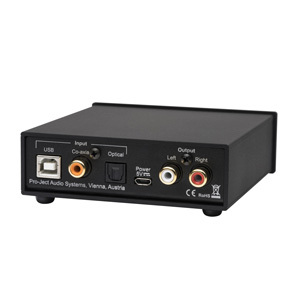 This DAC is capable of high resolution audio up to an impressive 32-bit, 768 kHz PCM and DSD512! 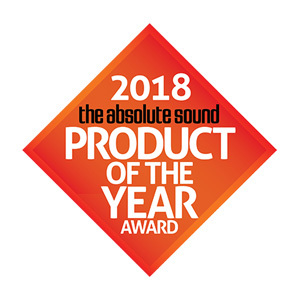 The Pre Box S2 Digital won a Best DAC/Headphone Amplifier 2017-2018 Award from EISA, the European Imaging and Sound Association, a unique association of nearly 50 trade publications from 23 European countries. "With an open and expressive nature, and supreme versatility, the Pre Box S2 Digital sounds bigger and bolder than it looks - making it great affordable hi-fi." Pre Box S2 Digital is also the very first Pro-Ject devices to support hardware MQA decoding. And it's also a Roon-ready product. Pre Box S2 Digital premieres the company's proprietary Optimum transient digital filter and its proprietary clock circuitry design. Pro-Ject is using a 16-core XMOS chip for asynchronous USB data transfer and full MQA hardware unfolding. The DAC directly controls the XMOS chip. A four layered, gold plated PCB with extra shielding is used to achieve optimal audio performance. Digital audio is all about the art of time, and with Pro-Ject's new proprietary clock design, the Pre Box S2 Digital manages jitter rates of unrivalled 100 Femtoseconds, which easily outperforms many renowned and respected audiophile clock generators. A huge problem for USB DACs is the transmission of noise through the USB output. 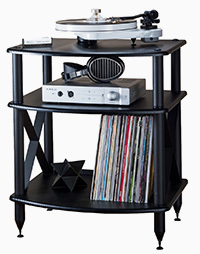 Pro-Ject vastly reduces the noise through both actively and passively filtering the output. After applying passive RF interference filtering, noise on 1 kHz drops to -125 dB, and at 10 kHz noise comes even close to -160 dB. Applying an active filter after the passive filtering has even more impressive results that are limited by the capabilities of the measuring equipment. The noise floor is at -160 dB or even lower. 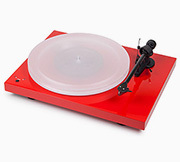 With organic polymer capacitors and thin film mini-MELF resistors, Pro-Ject was able to create a tiny device that will blow away even much bigger components for a much higher price. With a total of seven digital filters available onboard (including the proprietary Optimum transient digital filter), the sound can be shaped precisely to the listeners liking. 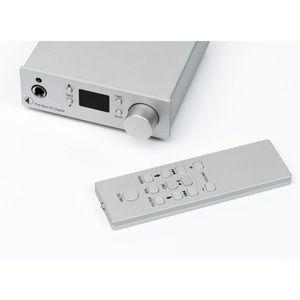 Pre Box S2 Digital is fully remote operation capable, and it can also control the playback software of a computer. For convenient fast access to your music, you can also access the Play, Pause, Forward, and Rewind functions directly from your Pre Box S2 Digital front panel. 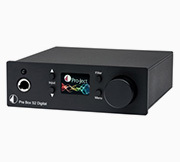 Pre Box S2 Digital provides up to 24-bit, 192 kHz decoding via its optical and coax inputs and up to 32-bit, 768 kHz via USB. 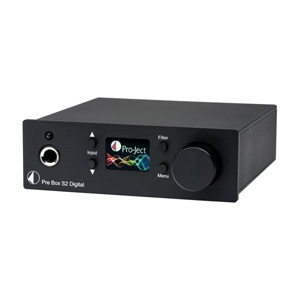 Pro-Ject is using dual DAC 2 x ESS9038Q2M, the newest generation of SABRE Digital to Analog Converter. The ES9038 SABRE DAC is a high-performance 32-bit digital to analog converter and uses ESS's patented 32-bit Hyperstream II modulator architecture and Time Domain Jitter Eliminator. 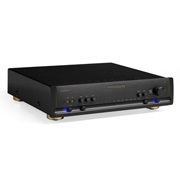 It is the first SABRE DAC to use new Dual-DAC architecture to further enhance performance. It also delivers an unprecedented dynamic range of up to 129dB and total harmonic distortion plus noise of -120dB (THD+N) - a performance level that will satisfy the most demanding audio enthusiasts. The ESS9602 is used for the headphone amplifier and output buffer. 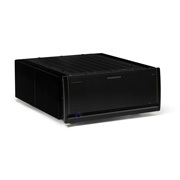 It supports a dynamic range of up to 122dB and THD+N of -117dB with 600ohm loads. Additionally, Pro-Ject implemented a unique feature that improves THD+N with 32ohm loads to -112dB in Best Performance mode. The ESS9311 is the industry's first low-noise, low-dropout regulator designed specifically for high-performance audio systems. 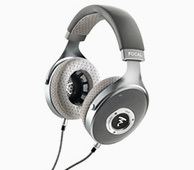 It is optimized for high resolution audio thanks to its revolutionary dual regulator architecture. 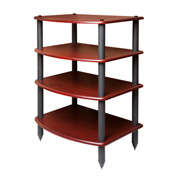 This innovative architecture contains series-voltage and shunt-voltage elements, eliminating the need for output decoupling capacitors - an industry first in audio system design. The ESS9311 provides the extremely low-noise outputs that are necessary for driving the reference inputs of audio converters and offers significant value-add for audio system designers. Dimensions W x H x D: 4" x 1.4" x 4"
"...offers audiphiles a very high-value DAC/Digital Preamp at an almost ridiculously low price. 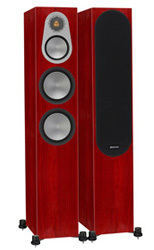 Not only does it include a plethora of important features and capabilities; it also sounds good, it has an elegantly designed control surface and is expandable." 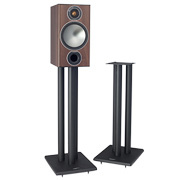 "...gives even audiophiles with limited means a way to assemble a first-class system." "This petite box shows that – in the world of digital audio – less can be more. Its long list of features includes full preamp functionality and the latest ESS Sabre DACs running in dual mono configuration. So it handles everything from DSD512 to 768kHz/32-bit PCM music media and will even recognise and decode MQA files. High quality passive components, an integrated headphone amplifier and a host of digital filter options complete the big picture. 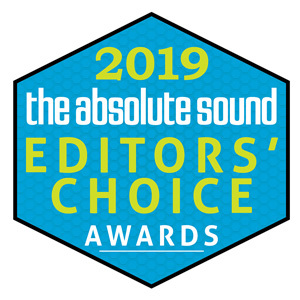 With an open and expressive nature, and supreme versatility, the Pre Box S2 Digital sounds bigger and bolder than it looks – making it great affordable hi-fi." Pro-Ject’s new S2 Digital brings things back home, providing an affordable, high quality preamp for desktop systems. USB hook-up means the S2 is still a portable option for laptop users, and it doesn’t need a battery. For the price, its sound performance is impeccable, combining clarity and precision with an attractive warmth and impressive sense of space. "The Pro-Ject Pre Box S2 isn’t just for audiophile newcomers. Perhaps you’ve been involved in high-performance audio for a while and already have a great-sounding DAC, but it lacks USB and MQA capabilities. Just add the Pro-Ject Pre Box S2 Digital to your system, connect it to a computer (or smartphone) via USB, and you can enjoy all the wonders of modern computer-based audio without a major monetary commitment." 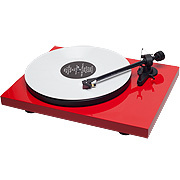 "I recommend the Pro-Ject Pre Box S2. Small, in the case of the Pro-Ject Pre Box S2 is, indeed, beautiful."